Product prices and availability are accurate as of 2019-04-16 14:11:50 UTC and are subject to change. Any price and availability information displayed on http://www.amazon.com/ at the time of purchase will apply to the purchase of this product. S(US 4-6)- Bust 32.68-36.61, Waist 25.20-28.74, Hip 34.65-39.37, Front Length 39.76, Back Length 51.97. M(US 8-10)- Bust 34.65-38.58, Waist 27.17-30.71, Hip 36.61-41.34, Front Length 40.55, Back Length 52.76. L(US 12-14)- Bust 36.61-40.55, Waist 29.13-32.68, Hip 38.58-43.31, Front Length 41.34, Back Length 53.54. XL(US 16-18)- Bust 40.55-44.49, Waist 33.07-36.61, Hip 42.52-47.24, Front Length 42.13, Back Length 54.33. XXL(US 18-20)- Bust 44.49-48.43, Waist 37.01-40.55, Hip 46.46-51.18, Front Length 42.91, Back Length 55.12. 1.Measure your size ( bust, waist, hips) first, compare with our size chart. 2.If your measurements not among the size, choose one size up. 3.There is 2-3 cm difference according to manual measurement. 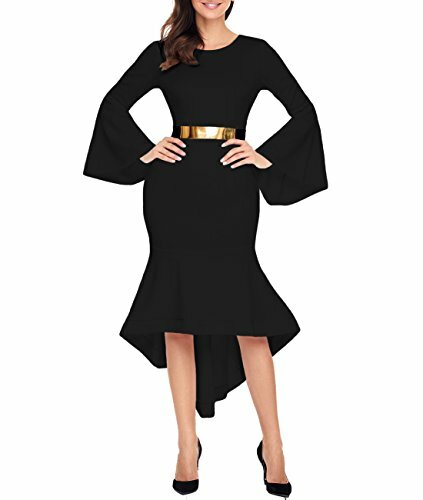 1.Plus size prom dress has a jaw dropping dip hem design, long bell sleeves, and a matching waist belt included for an extra notch of boldness. 2.Business dresses offers slim fit silhouette and elegantly flared sleeves and hemline design. 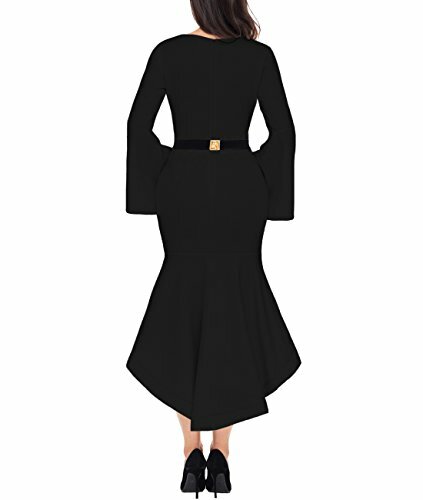 FEATURES- Round neck, long bell sleeve, high low hemline, waist belt and mermaid bodycon fit for this retro mermaid dress. SIZE- S, M, L, XL, XXL. Compare your measurements ( bust, waist, hips) with our size chart, if your measurements not among the size, choose one size up. OCCASION- The plus size bodycon dress is great for ladies to many occasions like formal, party, prom, datingand business. FABRIC- Made of 95% polyester and 5% spandex. Thick and soft fabric for party dresses comfort fit. GARMENT CARE- Dry Clean Suggested. Or hand wash in low temperature water with mild gentle soap, hang dry, do not bleach.